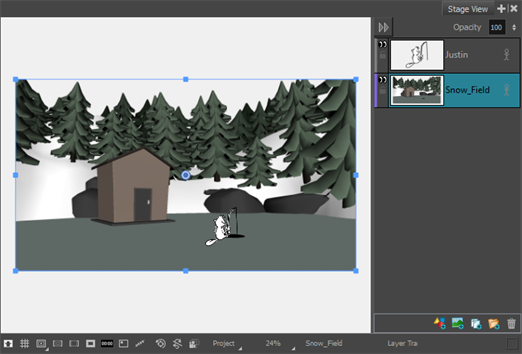 It is possible to add a 3D model to a 2D scene by rendering into a 2D layer. If you attempt to import a 3D model into a 2D scene, you will be prompted to choose from which angle and position the model is going to be rendered. Once rendered, the 3D object is added to your scene as a bitmap layer. Hence, from that point on, you cannot manipulate or animate the 3D object in all three dimensions, like you could with a 3D object in a 3D scene. You can only manipulate and animate the 2D layer in which the object is rendered horizontally and vertically, like you could with a regular drawing layer. Once the model is rendered in a 2D layer, it is possible to adjust the position and angle from which the model is rendered, and render it again. This updates the rendered 3D model throughout the entire panel in which it is rendered, as the position and angle from which it is rendered cannot be animated.